The Town of Orleans, incorporated in 1797, is a resort community on the outer Cape whose European history begins in 1642 with the first permanent settlement established by Nicholas Snow and his family. Settlers had purchased rights to the town from Mattaguason, sachem of the Manamoyick Indians. The Colonial economy was built on agriculture, especially corn, rye and wheat, plus the growing of hay and vegetables. In the 18th century commercial fishing and shell fishing supplemented local incomes and residents worked on herring boats and went after whales. 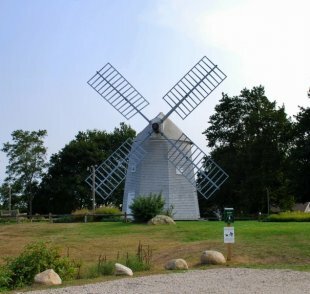 By the 19th century, coastal packets from Boston were being serviced and several windmills created power resources in the town, but the heaviest reliance by residents was on cod and mackerel fishing. Life long residents recall that in those days the very old and the very young farmed, while all the able-bodied men fished. Fishing in Orleans declined as competition from larger boats and larger ports grew, but the town had established a commercial importance on the Cape as a market center for other communities, that continues into the 20th century.